This month we have had the pleasure of interviewing Editor-in-Chief of Revista Científica UDO Agrícola, Professor Jesús Rafael Méndez Natera. Bioline has added articles of Revista Científica UDO Agrícola to its database since 2005. The journal includes articles on agronomy, botony, ecology, biotechnology and related fields. 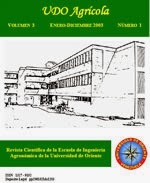 It is published by Escuela de Ingeniería Agronómica of Universidad de Oriente in Venezuela. Bioline: What is the history of Revista Científica UDO Agrícola? Jesús Natera: The creation of the Revista Científica UDO Agrícola (Scientific Journal UDO Agrícola) was approved by the Consejo de Escuela (School Board) in meeting No. 09 on December 14 2000. Its team was composed of Editors-in-Chief Profs. Jesús Méndez and Víctor Otahola and an Editorial Committee composed of Prof. Vicente Arturo Michelena Alegría (Agronomy Department), José Alexander Gil Narín (Agricultural Engineering Department) and Jesus Rodriguez (Agricultural Economics and Social Sciences Department). The journal got its Legal Deposit (Depósito Legal) and ISSN (International Standard Serial Number) in 2001. Bioline: How has Bioline contributed to Revista Científica UDO Agrícola's visibility? Bioline: What has your experience been like working with Bioline? Jesús Natera: My experience has been very satisfying and rewarding. Bioline has been very responsible and consistent with the Journal UDO Agrícola and myself. Its work has been excellent and selfless. Bioline: Why is open access important for journals like Revista Científica UDO Agrícola? Jesús Natera: Open access is very important for UDO Agrícola because it brings many benefits that include lower costs, greater accessibility, and better prospects for long-term preservation of scholarly works. Also, open access allows UDO Agrícola to disseminate their contents around the world, especially the poorest nations where researchers and university teachers cannot afford the price of a scientific paper. Bioline: Has the open access environment changed for Revista Científica UDO Agrícola? If so, how? 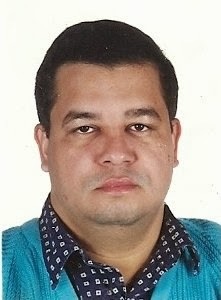 Jesús Natera: Udo Agrícola has been open access from its creation. Bioline: What kinds of open access developments do you see in the future for Revista Científica UDO Agrícola? Jesús Natera: I think the open access developments of UDO Agricola will remain similar in the future.